We have assembled here a few special pieces that should be of interest to collectors of Japanese kimono and other textile art. These have been selected for their historic interest, rarity, age, quality, or special artistry. The group includes all types of garments. Most, but not all, of the antique pieces here are more pricey than the vintage garments on our other pages, but price has not been the major determinant. The line between "collectible" and "decorative" pieces is very fuzzy and indeed subjective. Some lavish wedding kimono, furisode, or tomesode on the other pages, for example, may exceed the items below in cost, and could just as well have been included here. We can expect many of the best hand-decorated vintage pieces to become increasingly valuable as their rarity becomes more evident and their beauty and superb craftsmanship are more widely appreciated. To go back to the first kimono page, click here. Assorted questions are discussed in Kimono Questions. Or read about Kimono Decoration Techniques. To see large photos of each piece, click on the inventory numbers. and small touches of silk embroidery. 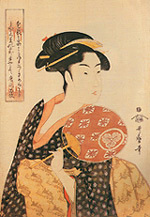 yuzen dyeing and sumi-e hand painting.